This is not from my own travels, neither is it from one of those fancy travel books displayed on the front isles of book stores. I picked this tiny hundred page book, thinking it was going to be a light read, but I just could not read it on one shot. I needed about five sittings...it was just too much to imagine and assimilate. Ruskin Bond’s “All Roads Lead to Ganga” brings ethereal beauty to not just the Himalayas, but to India in its element…the people, the beliefs, the temples and all of it interspersed with history without transgressing the boundaries of veracity. I will try not to make this post into a book review (Because I read very few meaningful ones which do justice to a book, one way or the other, and hence will not attempt it without enough time on my hand). This is only to talk about some little known, and some better known places (my fav picks from the book) Ruskin Bond writes about, and for me to be transported into a magical world every time I read it. Moving from the quaint charm of Dehradoon , Ruskin travels to the Manjari village in Garhwal. A tributary of Ganga flows here, and on its banks there are fields of corn, barley, mustard, potatoes, and trees of apricot and peaches. “True, but we cannot eat scenery”, said a villager. And yet these are cheerful sturdy people with great powers of endurance. He now moves on to Missourie, giving interesting tidbits about the history, the local activities, bazaars and the people, and how one can trek 9000ft to the Nag Tibba. At Rudraprayag, the waters of the Mandakini, from the glaciers above Kedarnath joins with the waters of the Alaknanda, from beyond Badrinath, the confluence of these rivers bringing a certain sanctity and purity. As one travels up the Mandakini valley, there is a tiny township by the name of Agastamuni, decked with banana fronds and poplar leaves swaying in the cool breeze. Further up the river is Guptakashi, a village adorned with Magnolia trees and flowers. With no form of public entertainment, the village sleeps early and wakes early. On the side, the snow capped Chaukhumba is dazzling, and here in Guptakashi as in Benaras, Shiva is worshiped as Vishwanath. (figured it yet? Gupta? Kashi?). The famous saying here is “jitney kankar utne shankar”. As pilgrims proceed further north, they will reach Kedarnath, and the last day’s worth of journey could only be covered on foot or horseback. The arms of the lord are worshiped at Tungnath, the face at Rudranath, the belly at Madmaheshwar, and the hair and head at Kalpeshwar, near Joshimath. These five sacred shrines form the panch kedar. Now that you have read the book, I advise you to even visit the place...because I fall in love with those meandering roads, those snow capped mounts ever since I was three years old. And in my teens I spend hours reading Bond...both the things are close to my heart. @Wanderer: I cant wait to visit all these places and more! 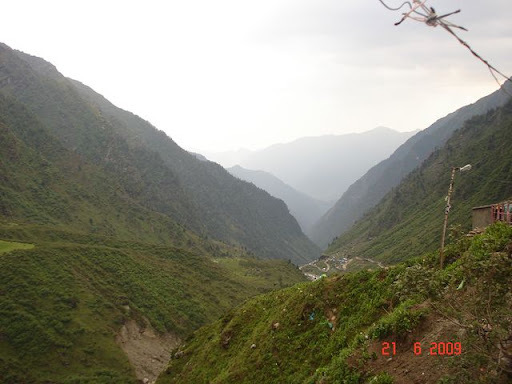 Oh I sincerely believe that if you haven't seen the himalayas, you have missed a very beautiful experience of ur life.